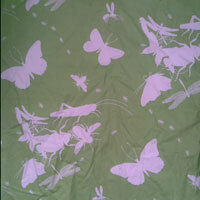 I bought this scrap of fabric from ebay last year and loved it so much I was desperate for more. Unfortunately according to the seller it’s been discontinued, so when it came to making curtains for Warner Jnr I tried to recreate a similar effect through screen-printing. Didn’t quite come out as well as I’d hoped (might have been something to do with the fact that I was 8 months pregnant and could hardly bend over the fabric), so I’m still on the lookout for this stuff … if anyone reading this blog (I guess there’s a remote possibility) recognises it, drop me a line if you ever see it around!